A couple of months ago I had the opportunity to art direct a photo shoot in Asia. On the itinerary: Japan, Taiwan and South Korea, over the course of a three-week period. So I wanted to see if I could do the entire trip with one bag. For everything. Clothes. Shoes. Computer and cords. Toiletries. And the bag had to have room for a souvenir from each country. 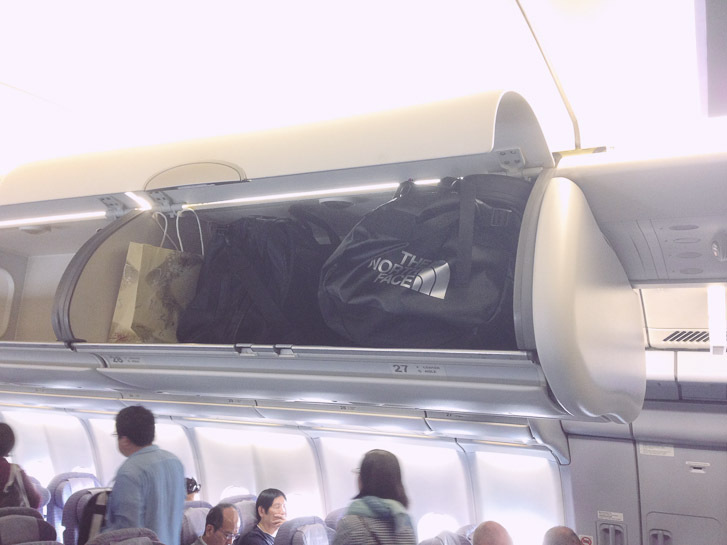 And it had to be a carry-on. 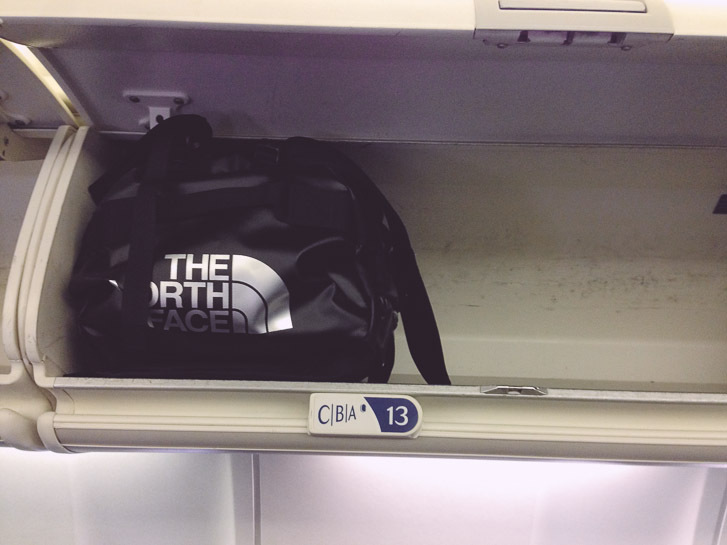 The trip was very last minute and I didn’t have a whole lot of time to research which bag would be ideal. 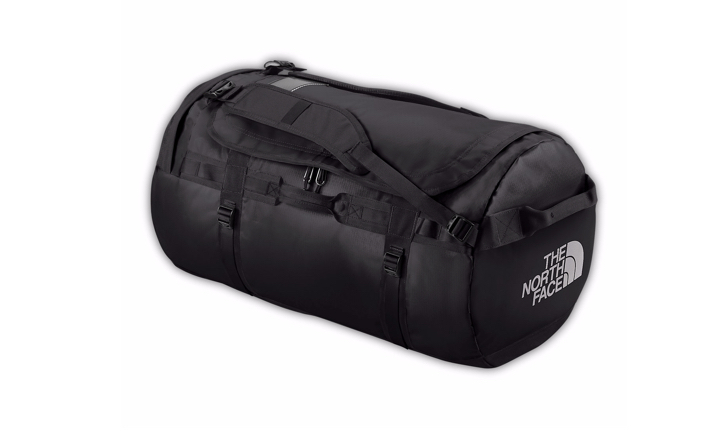 I did, however, get a piece of advice from one of the photographers I was traveling with to check out: The North Face Base Camp Duffel bag (specs below). He had recently gone on a backpacking/Airbnb trip to England for two weeks and took the very bag he was recommending to me. I went down to my local sports store and picked one up. I didn’t know what size to get, so I got the medium and just rolled with it. 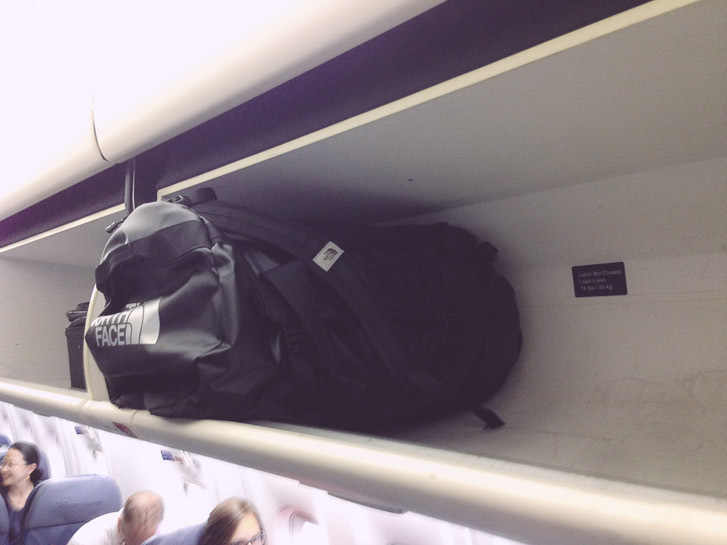 You can read all the technical stuff about the duffel on The North Face site, but in short, the bag rocks. It was exactly what I needed. I plan to use this bag for all my future work trips. 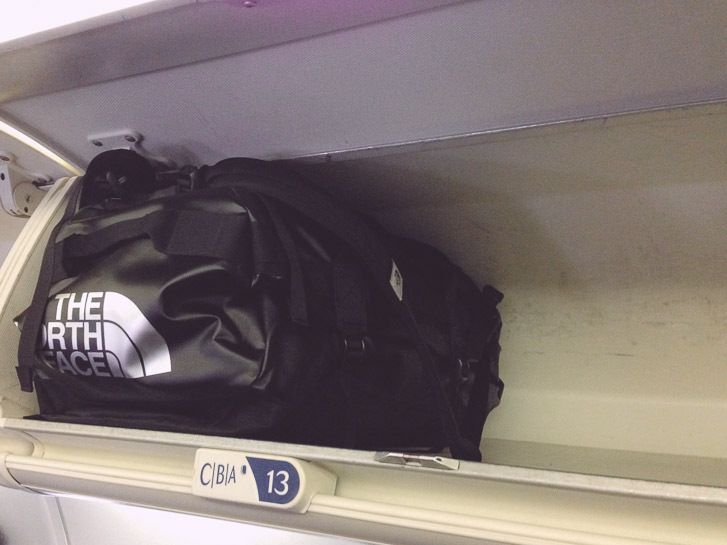 At first glance the bag looks small, but I was able to fit everything in without a problem – even with a little room to spare. The only thing I can say is, I wish I had bought the smaller bag (size: Small) and packed lighter. The bag was heavy, and was a little awkward carrying it on my back because of how full it was packed. Originally, my plan was to launder all my own clothes in the hotel room, and do three loads over the course of the trip. But looking back, I would have packed less and brought clothes that were more travel-friendly, and washed my clothes more often. Washing a week’s worth of clothes in a hotel sink is a pain, not to mention the drying time. And Asia in the summer is humid. It takes forever for clothes to dry. I got pretty creative on how and where to hang wet clothes in a small hotel room. 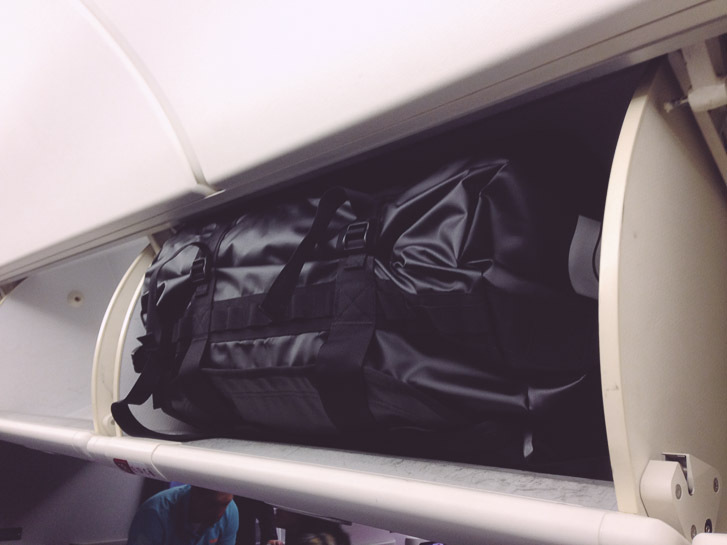 Even though I packed on the heavy-side, the bag fit in all the airline overhead compartments. 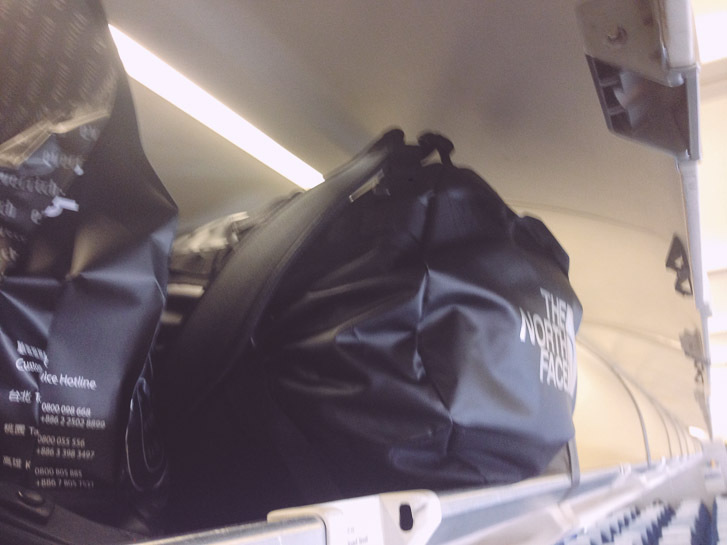 It was a little tight, and I did get some interesting looks from the flight attendants and passengers – another reason why I would opt for the smaller-sized bag. It fit. I promise. Just needed a little love. Cover photo from The North Face website. Trello. I love you, but we need to talk. Thanks for the post. I’m looking to buy this duffel in the same size and this is very informative. 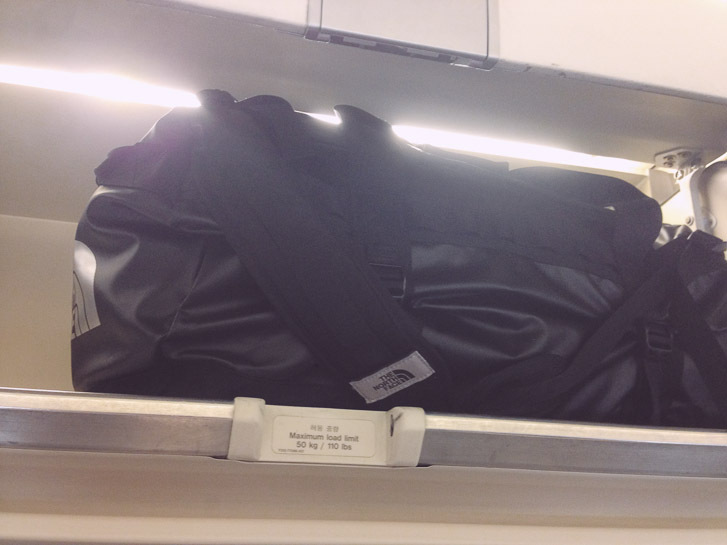 I’m flying to Melbourne through United, which allows a standard carry-on size. Afterwards I will be flying on AirAsia, and as a budget airline, is pretty strict about carry-on size. I’m curious if you flew on AirAsia, or any other Asian budget airline during your trip. Thank you so much for this informative post and the pics!!! Hi! Any challenges with the bag being all black inside – low visibility makes things difficult to find? thanks for your post, man. the photos where of most help. on the north-face website you can’t appreciate very well the sizes, they all seem practically the same. Best post so far. I have been doing research for the past week. Thank you! About to get the size XS & S.
Hi Sophie. Sorry, I have not checked this in a while. I have not had any issues with visibility. Thanks for this!! I’m going to Asia for a month and need to pack a carry on for the outbound flights so that I can jump onto a different connecting flight than my official itinerary. I have a large base camp duffel so now I know to only pack it to about 70% capacity to that it will be the same size as the medium and have room to be compressed into the storage bins. Very informative, thanks again. Great review. I am going to Thailand/Vietnam for 3 weeks and was going to buy the large. Now I’ve read your review, I’m leaning towards the medium. I’ve just bought the medium and it’s plenty big enough! I’m about to fly to fuertaventura and so have been contemplating this or a regular suitcase. It’s great and appears to be very strong. Also very helpful post, cheers!